When it comes to eating for weight loss, you’ve probably heard every piece of advice out there: Drink three glasses of grapefruit juice a day, eat egg whites for breakfast, or replace all your greens with kale. It’s a convenient strategy to latch onto one specific food in the hope that it will completely transform your body, but unfortunately, that’s not the case. Krista Haynes, R.D. and Beachbody nutrition manager, says weight loss doesn’t come down to one particular food. Losing weight “is a super-complex process that involves diet, sleep, stress reduction, physical activity, and genetics,” Haynes says. That being said, there are certain foods that are healthier and more nutrient-rich than others; foods that pack tons of protein into a small number of calories, for example, or foods that can help increase your satiety and provide intense flavor without any added sugars or trans fats. Keep in mind that the rest of your habits matter, too: “Eating these foods won’t do any good if you’re eating fast food, sitting on the couch all weekend, or feeling overly stressed about work stuff,” says Haynes. But when you combine healthy foods with a balanced diet, regular exercise, hydration, and adequate sleep, your weight-loss goals will start to look more realistic. Here are 10 foods that will help you get to those goals. “Eggs are an excellent protein source in a small calorie package,” says Haynes. One large egg contains between 70 and 90 calories, depending on how it’s cooked (hard-boiled eggs are on the lower end of the spectrum, while fried eggs are at the higher end) and has roughly six grams of protein, six grams of fat, and one gram of carbohydrates. Eggs are also full of important nutrients like calcium, folate, and vitamins A and D.
Haynes says the protein in eggs can help you feel full and quell the urge to snack throughout the day, which could help with weight loss. In a study published in the International Journal of Obesity, two groups of overweight and obese individuals started a reduced-calorie weight-loss diet: One group ate eggs as part of their breakfast and the other ate bagels. The group that ate an egg breakfast experienced 65 percent greater weight loss than the group that ate a bagel breakfast. Pro tip: Easy ways to add eggs into your diet — scramble a couple for breakfast with chopped veggies, slide a fried egg on top of your avocado toast, or nosh on hard-boiled eggs as an afternoon snack. Almonds hit the nutrition trifecta: They’re full of fiber, protein, and healthy fat, making them a great balanced snack choice, says Haynes. The only catch? “Calories add up quickly when munching on almonds,” Haynes says, so you have to be smart about your portions. The USDA’s recommended serving size of almonds is one ounce, or 23 whole nuts, which have 164 calories, 14 grams of fat, five grams of carbs, and about three grams of dietary fiber. Pro tip: To get the fiber and protein without overdoing it, Haynes suggests eating raw, unsalted almonds instead of a carb-heavy muffin or sugary breakfast bar. She also recommends sprinkling slivered almonds on your oatmeal or grinding them into almond butter to spread on apple slices or celery sticks. Avocados are everyone’s favorite source of healthy fat, but they’re also calorically dense, says Haynes. According to the USDA, the recommended serving size is about 30 grams, or one-fourth of a medium-size avocado — in other words, way less than what most people eat. One-fourth of an avocado contains 50 calories, less than one gram of protein, about five grams of fat, three grams of carbs, and two grams of dietary fiber. But the fiber in avocados, combined with their rich, buttery taste, means you may not need to eat as much to feel satisfied, says Haynes. The monounsaturated (or healthy) fat in avocados is also a key macronutrient and may help with weight loss. A study published in the Journal of the American Medical Association showed that eating a diet with a high percentage of fat (60 percent) may increase your resting energy expenditure. 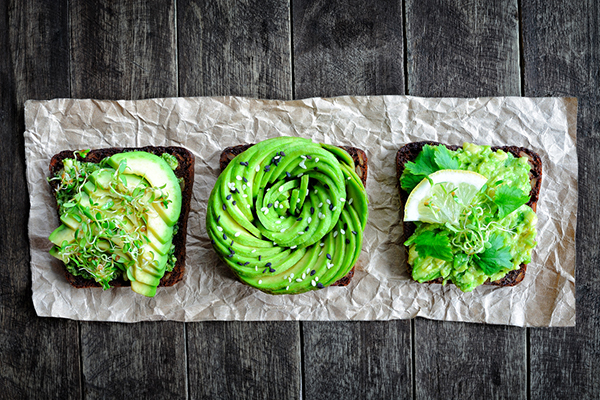 In addition, the Journal of the American Heart Association published a study that found that eating one avocado per day as part of a moderate-fat, cholesterol-lowering diet can help lower LDL cholesterol levels. “This, of course, doesn’t give you free reign to eat all the fat you want — portions still matter,” says Haynes. She recommends spreading avocado on your sandwich instead of mayonnaise or adding a few slices to salads, eggs, or healthy tacos. You can also blend avocado in smoothies or eat a few spoonfuls peppered with chili flakes or sea salt as a savory snack. Pro tip: Just remember that avocado should be an addition to your meal, not the main dish. “Watch out for the chips and guacamole, as that can be a calorie bomb,” says Haynes. This cruciferous veggie is low-calorie and loaded with nutrients like calcium, potassium, and vitamin A. One cup of raw shredded cabbage contains 18 calories, roughly four grams of carbs, two grams of fiber, and less than one gram of fat and protein each. The appeal of cabbage as part of a weight-loss nutrition plan is that you can eat a lot of it without racking up calories. Haynes recommends incorporating fermented cabbage (sauerkraut or kimchi) into your diet to promote gut health. You can eat it on its own or toss it in a veggie bowl with your favorite protein and quinoa. If you’re not a fan of kimchi, try mixing raw cabbage in your salads, making ground turkey tacos with cabbage wraps, or adding cabbage to a hearty soup. Despite being praised online as a quick weight-loss solution, grapefruit doesn’t actually have a special fat-burning ability, says Haynes. Rather, it’s the high water and fiber content that can help you feel full and consume less food, she adds. A study published in the Journal of Medicinal Food confirms this. The results showed that eating grapefruit led to modest weight loss: People who ate half a grapefruit three times a day before each meal lost about two pounds more than those who didn’t. “Alone, grapefruit is low in calories,” says Haynes. According to the USDA, half a grapefruit contains 52 calories, 13 grams of carbs, two grams of fiber, and less than one gram of fat and protein each. The fruit is also a great source of calcium and vitamin C.
To get all the nutrients of grapefruit without the added sugar and calories, stick with fresh grapefruit rather than grapefruit juice. Eat it as a snack topped with cottage cheese, or pair it with a veggie omelet for breakfast. Pro tip: One word of caution — it’s advised against eating grapefruit if you’re taking certain prescription medications, Haynes says, so check with your doctor before adding to your diet. Oatmeal is a fantastic source of complex carbs, dietary fiber, and protein, all of which can help you feel full for several hours, says Haynes. One cup of cooked oats has 159 calories, and it contains about six grams of protein, 27 grams of carbs, four grams of fiber, and three grams of fat. “Oatmeal is a great canvas to add other nutrients to,” Haynes says. She likes berries, banana slices, walnuts, chia seeds, or a drizzle of almond or coconut butter. Just be careful not to overdo it — dried fruit, sweetened coconut flakes, and big gobs of nut butter can contain tons of added sugar and extra calories. Another healthy option for oatmeal? “Use rolled oats as an ingredient in protein snack balls,” says Haynes. In addition to being a great source of lean protein, which Haynes says helps you maintain your muscle mass when trying to lose weight, salmon is also packed with healthy omega-3 fatty acids, which your body can’t produce. One three-ounce fillet of salmon has 155 calories, 22 grams of protein, seven grams of fat, and zero carbs. “Salmon is a great option as a dinner alongside some veggies and a whole grain or starch like quinoa or sweet potato,” Haynes says. She also suggests salmon jerky as a protein-rich snack or smoked salmon on a sprouted whole-grain English muffin for breakfast (nix the cream cheese). Not all yogurts are created equal when it comes to weight loss. Most flavored yogurts and store-bought brands are packed with added sugar, Haynes says. Plain, unsweetened, 2% Greek yogurt, on the other hand, is low in sugar and high in protein. Haynes recommends it as a healthy snack option or cooking substitute for heavy ingredients like sour cream and cream cheese. Yogurt also contains probiotics, “which may help with weight loss by improving the ratio of good to bad bacteria in the gut,” Haynes says. The USDA’s recommended serving size of Greek yogurt is one cup, which has 100 calories, six grams of carbs, less than one gram of fat, about six grams of sugar, and a whopping 17 grams of protein. It’s also loaded with calcium and potassium. Top a cup of unsweetened Greek yogurt with berries and ground flax seeds for an easy breakfast, or blend it in your green smoothie for some extra protein. Spinach, like cabbage, is low in calories and high in fiber and water content, meaning you can eat a lot of it without making a dent in your total calories for the day, says Haynes. For example, one cup of raw spinach contains just seven calories, almost one gram each of protein and fiber, and one gram of carbs. There’s also some research to suggest that thylakoids, the internal membrane system in green plants like spinach, can help facilitate the release of satiety hormones in the body. A study published in the Journal of the American College of Nutrition, for example, found that taking a thylakoid-rich spinach extract before breakfast may help reduce hunger and snack cravings and increase satiety for over two hours. To incorporate more spinach in your diet, Haynes suggests blending a couple of handfuls into your smoothie, tossing it in your veggie scramble or strata, adding it to soup, or swapping it for romaine lettuce in your salad. There may be some truth to the old adage that an apple a day keeps the doctor away. One study published in the journal Appetite found that eating an apple at the start of a meal may help with weight management. People who ate one medium-size apple before a meal reduced their food energy intake by 15 percent and reported feeling fuller. That’s because apples are filled with fiber and water that can help increase satiety, says Haynes. One small apple has 20 grams of carbs, about four grams of fiber, 15 grams of sugar, and less than one gram each of protein and fat — all for 77 calories. Munch on an apple plain, sprinkle it with cinnamon for extra sweetness, or add apple slices to your salad for some crunch. Certain foods are loaded with a combination of protein, fiber, and important nutrients that can help you feel full and squash your urge to snack. Eating these healthy foods can help you in your weight-loss journey — but only if you take other steps as well. To maximize your weight loss, incorporate these 10 nutrient-rich foods into a balanced diet, step up your exercise game, and make sure you’re getting plenty of water and sleep.